Brisbane Technology Park (BTP) – established in 1987 on 33 hectares. The precinct is now home to over 130 leading local, national and international companies. 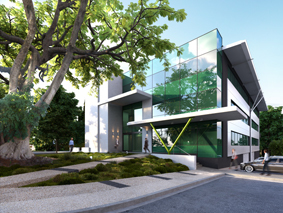 BTP Westlink Green – a new business and technology precinct adjacent to Darra Railway Station. Providing both office and technical facilities, the precinct’s first building has been completed, and the second is underway. BTP Northshore Hamilton – Strategically located between Brisbane CBD, Australia TradeCoast and Brisbane International & Domestic Airports this new precinct has taken shape in the last month with practical completion of the first building imminent. Graystone has received numerous industry awards for its projects and continues to set the benchmark for quality business and technology precincts in Australia. Due to its increasingly diverse property activities, Graystone faced a number of areas of regulatory complexity as well as the challenges of a growing business, including new business streams. Since 2009 Daniel Gill, a Partner in Pilot’s Corporate Advisory Division, has worked closely with Graystone. He has assisted the business in meeting its regulatory obligations as well as helping them navigate through growth-related financial challenges. In addition to providing a wide range of audit and assurance services, Daniel has shared practical advice which has given Graystone and its stakeholders further confidence in its financial reporting and internal governance. “Having dealt with Daniel for a number of years through the trust account audit process, we approached him to undertake our annual builders licence review and company audit,” said Bruce Anderson, Graystone’s Director of Finance. “We have found Daniel’s approach pragmatic and commercial”. Daniel has since introduced the Taxation Services division to Bruce and the Graystone management team. They have assisted with the organisation’s tax structuring and planning. Despite the general downturn in the Brisbane commercial sector during the GFC, Graystone has continued to grow. It has stayed ahead of the trend which has seen businesses look for tenancy outside the CBD as a means of improving costs, environment and productivity. Within each precinct, Graystone is also rolling out its BTP Hub offering to capitalise on the business trend to a more mobile workforce. Each Hub provides dedicated suites available for small businesses, flexible hot desk infrastructure for travelling professionals and individual offices. Daniel’s detailed understanding of the construction, development and real estate industries has ensured Graystone is able to implement optimal solutions and meet financial reporting obligations. Access to accounting resources that can be called upon at any time. For more information contact Daniel Gill or Chris King from our Corporate Advisory Division on (07) 3023 1300.